The introduction of the ARRI ALEXA camera has given the high-end production world a fantastic new digital cinematography tool that combines a variety of recording modes with a robust, production-ready form factor. Most of the details can be found at ARRI Digital, but ALEXA offers HD recording using SDI outputs or on-board Apple ProRes recording. Its large sensor also enables higher resolution recording in the ARRIRAW format, using their proprietary T-link connection to an external recorder. DoPs can have the best of both worlds – camera raw, as well as direct-to-edit recording. I believe that most crews producing for television projects are going to stick with either on-board ProRes or external video recording options. My guess is that most will skip the ARRIRAW method, unless it’s a project destined for theatrical projection. If a crew opts for external recording, then standard systems like the KiPro, Nanoflash, Cinedeck or an SRW deck will be the logical choices. On-board recordings are stored to two SxS cards, similar to a Sony EX camcorder. ARRI opted to use the Apple ProRes 422 codec family, so the menu can be set to record in any of the five flavors: ProRes 4444, ProRes 422 (HQ), ProRes 422, ProRes 422 (LT) and ProRes 422 (Proxy). In most cases, these would be intended as 1920×1080 master files, which means that typically the operator would set the camera for ProRes 4444 or ProRes 422 (HQ). ARRI has posted a handy camera simulator to help users understand the camera’s menu structure. Another option would be to record master files to an external recorder or in ARRIRAW and use the ProRes on the SxS cards as “dailies” for the editorial team. A real differentiating factor of the ALEXA is the ability to record with two gamma profiles: Rec709 and Log C. These profiles define how an image will appear on a monitor. HD video is based on the Rec709 standard. Log C is a alternate profile designed to squeeze the full dynamic range of the senor into a video recording without clipping highlights or crushing blacks. It is designed to mimic the profile of 35mm negative after being scanned using the Cineon format. The logarithmic concept for image profiles stems from film scans, but variations of this idea have been used in other camera implementations, like Sony’s hyper-gamma and Panasonic’s film-rec profiles. None of these are as extreme as Log C, so when users first see an uncorrected Log C image, they are taken aback. Log C images appear as having very low contrast with lower chroma saturation when viewed on a standard video monitor. Gary Adcock and Art Adams have done nice jobs of dissecting how ALEXA deals with dynamic range and color profiles. Unfortunately, what I’ve found is that the average production and post professional gets very dazed and confused when you start to talk about log space. I’m just a poor country editor, so what follows is a far more simplistic explanation of what Log C is and how to deal with it in post. 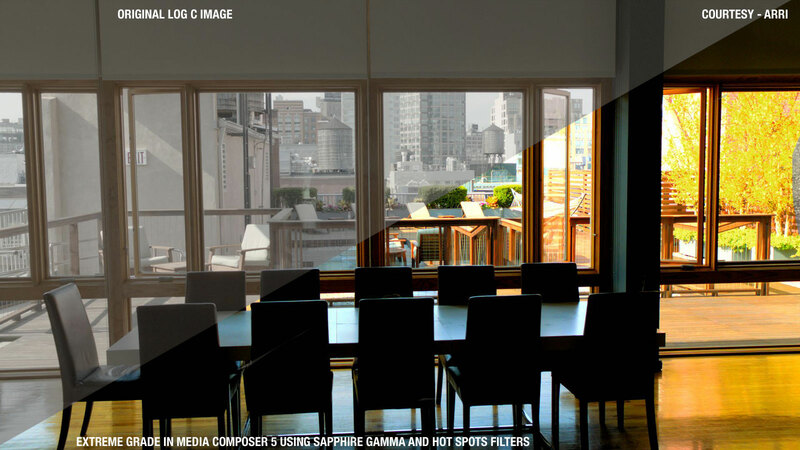 Think of the dynamic range that the sensor is exposed to from black to white as a yard stick. When you fit that yard stick diagonally into a box of exactly the right size, then the yard stick remains straight. But the current display range of video is a “smaller box” – so in order to fit the yard stick, you have to cut off one end (clipping highlights) or the other (crushing shadow detail). Or, you can simply push in on the ends of the yardstick, causing it to bow and thereby able to fit into the box. This approach to “push in the ends” and “bow” the yard stick is precisely what a Log C profile is doing. Except that it’s doing it mathematically by remapping luma/chroma/gamma coordinates. The visual manifestation of this profile is a low-contrast, “flat” video image. In order to correctly “straighten” the curve, you have to apply a LUT (look up table), which alters the values to a new profile based on the target display space. A LUT simply converts the video from one space (the recording) into another (how it is to be displayed). So the conversion LUT for a Rec709 display would be different than the LUT for a digital cinema projector. For better or worse, most video projects are not nearly so precise, which means that the Log C image from an ARRI ALEXA can be turned into a nice, viewable (Rec709) image with very simple tools. I should interject at this point that I am advocating an approach that is technically incorrect, but works in a practical sense. Most colorists are going to throw their hands up in disgust here, but I’m suggesting a workflow that’s appropriate for many video projects (spots, corporate, web, some TV), but probably shouldn’t be followed when a completely accurate rendition is important. This would most likely be the case when using the ALEXA for a feature film or high-end visual effects. In that instance, you really do want the proper conversion LUTs. Grading is very subjective and the Log C profile is within an adjustable range. In other words, you can use built-in correction tools and get a very pleasing image, even though that might not be the correct technical approach. This means that if you are working with Log C ProRes files in Avid Media Composer, Apple Final Cut Pro or Adobe Premiere Pro, it’s a simple matter of applying the standard color correction tools to a clip and make it look good in your Rec709 monitoring environment and output to tape. One good tool is Nick Shaw’s LUT for ALEXA. It’s a FxScript plug-in for FCP that corrects the contrast range and increases chroma saturation. Since his processing is only 8-bit, he disclaims it as to be used for preview purposes only; but quite frankly, I think you could successfully master with it on many projects. It also adds an optional timecode and text burn-in generator, making it an ideal tool to use when delivering “dailies” to a client. Click on this image to see an enlarged view. I have done some limited experimentation with ALEXA clips, so this is by no means an exhaustive post on the subject; however, here are my observations thus far. The ARRI ALEXA is capable of a wide dynamic range with very low sensor noise. The Log C profile generally keeps the midrange tones in the right location and pushes the highlights and shadow detail towards the middle. The highlight range tends to be more compressed leaving a lot of range for shadow detail. When you expand this overall range, the midpoint is largely unchanged, which means that you introduce very little noise into the grading process. When you adjust levels to raise the gamma or add “black stretch” on a typical Rec709 image, you inevitably inject video noise. I don’t see this same sort of anomaly in the few ALEXA clips that I’ve taken through some grading tests. In fact, I’ve done some pretty extreme changes to these clips and they’ve held up quite nicely. In the next couple of posts, I’ll discuss some editing workflow routines that can be used with ARRI ALEXA projects. This entry was posted in apps-gear-filters, ARRI ALEXA, color grading, workflows and tagged ARRI ALEXA, color grading, workflows.